I know there are plenty of websites where I can go to find the weather conditions. But can I get my local weather forecast delivered automatically to my desktop or inbox every morning? 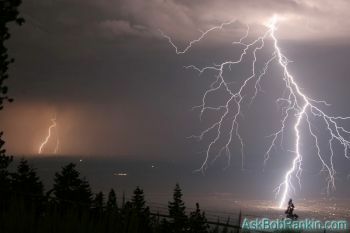 Yes, in addition to local weather maps and forecasts for thousands of cities around the world, the Internet offers a wide array of tools to help you learn about weather phenomena, keep current with weather conditions, and alert you to approaching storms. Here are some of favorite weather-related websites and online services. The Weather Channel website offers many useful features, such as the free Desktop Weather software for Windows. The current temperature for the city of your choice will show in your system tray. Click the icon, and Desktop Weather will display the latest weather conditions and forecasts. (Mac users: check out EarthBrowser. Sign up for Inbox Weather and they'll e-mail you the forecast daily. Want to dig a little deeper? Weather Channel also offers health-related weather info such as Pollen Reports, Air Quality Forecast, Aches and Pains, and Skin Protection. If you're planning a trip across the USA, look for the Interstate Forecast planner before you go. You'll find color-coded maps showing weather conditions for cities along your way, and printable 10-day forecasts along the major U.S. interstate highways. Weather forecasts for the UK and cities around the world. You can also check out the World Skiing Guide, the Weather Quiz, Fact Of The Day, and (for serious weather nerds) the Weather Chatrooms. Find it at http://www.bbc.co.uk/weather. Weather Underground is noteworthy because it offers historical weather data, astronomical info, and links to personal weather stations operated by individuals in your area. Check it out here: http://www.wunderground.com. The National Severe Storms Laboratory is an internationally known research laboratory, leading the way in investigations of all aspects of severe weather. NSSL's Weather Room provides information for kids and adults. Learn the what, where, whys, and hows on tornadoes, hurricanes, lightning, and thunderstorms. There are also resources for teachers to print and use for weather education in the classroom. A related site operated by the US government's National Weather Service is the Storm Prediction Center, which will show graphical maps of the USA with Watch, Warning and Advisory bulletins. An RSS feed is also available to provide the latest information about approaching hurricanes, tornados, severe storms, floods and fires. Perhaps more convenient (but not free) is the Weather.com Notify! service which will send you urgent storm alerts by phone, e-mail, text message or pager. This service is customized for your location and is free for seven days. Most recent comments on "Weather Forecast"
For many years now I have been using "My-Cast" for my daily weather needs. Enter your zip code, city, or GPS coordinates and your Home location is centered on your choice of a standard weather map, a visible satellite image, or an infrared image. You may zoom in or out as you prefer. Up to four daily email forecasts are available and you can choose as many locations to monitor as you wish. You can also customize your forecast according to your outdoor activities or hobbies. Let me plug one more site. The Government. www.weather.gov. I have found some cool features here. This is fun when a storm is in your area or one is coming. You can type in your zip or city for a forecast but the fun part is its radar. Click on the radar tab. You will see a national map. Then click on the map for your area or location. You will get a map of your area. On the left, you have some options: Reflectivity and Velocity with Composite, Base, or Storm Relative Loops. Here is the cool part! Try Base Velocity link. As soon as you click on a choice you get an animated map. You can ZOOM right into your area with just a few miles!! This is not obvious but all you have to do is click on the map and it starts zooming. Just keep clicking! You can see if it's raining/stormy on your side of town or around the corner at your neighbors! You control the speed of the animation. The updates are much more often than any of the other web sites-within minutes of the current time. Now click and hold on the map image and move the map in any direction ala google maps! Cool, right??!! Let's see, where should I go for my weather predictions, some commercial site that gets all its data from NOAA and reprocesses it, or from NOAA itself, our government organization, the one with the weather satellites and the biggest super computers and best weather models, paid for with our tax dollars! C'mon, Bob! They have the best government site on the web. A shortcut to the NOAA's weather info is weather.gov (go figure). From there, put in your zip code, then check the weather forecast for your region. Scroll down and look for the radar images on the right. Click on the leftmost radar image to see real-time radar for your area. EDITOR'S NOTE: NOAA is indeed the source for some of the weather info on other sites. And Weather.GOV is nice if you want JUST the forecast. But Weather.COM does add value... namely: their own video broadcasting, weather & allergy info, interstate/driving forecasts, world weather, and other nice features. For some time, I've been using AWS, which aggregates observations from many local schools, airports, military bases, and private weather stations to give a very accurate local observation station. I also use Weather Underground, and added several locations of interest to my "favorites" there, so they show up on all radar and other maps on the site. For larger-scale maps that are pretty rich in information, if sometimes up to 15-20 minutes old, www.intellicast.com has some excellent data sources. (Can you tell I'm a bit of a weather freak? Comes with the pilot's license - grin) ForecastFox is also very nice, it shows current conditions and the next few days' forecast right in Firefox. Here is a good site and is more accurate, forecast advisor. is it possible to get the weather and air quality for my town on my computer every morning without having to go to google and do dozen clicks on all sorts of maps, etc? Before moving here i had another provider (not available here) and could do so, as well as by putting in area code of another city, get their daily forecast also. all free.